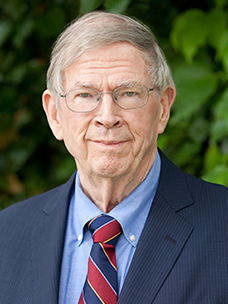 BOSTON—Dean and Professor Emeritus John H. McArthur (MBA 1959, DBA 1963), who served as dean of Harvard Business School from 1980 to 1995, has been appointed an officer of the Order of Canada (OC). He is a native of Burnaby, British Columbia, and earned a bachelor of commerce degree in forestry from the University of British Columbia (UBC) in 1957. The announcement was made in Ottawa on June 28 by the Governor General of Canada, the Right Honorable David Johnston. The Order of Canada, one of the country’s highest civilian honors, was established in 1967, during Canada’s centennial year, to recognize a lifetime of outstanding achievement, dedication to community, and service to the nation. McArthur is one of 34 distinguished Canadian citizens to receive the honor this summer. A member of the HBS faculty since 1962, McArthur taught courses in corporate finance and related fields in several of the School’s educational programs while also engaging in research and course development in Europe and North America. In 1973 he was appointed the Sylvan C. Coleman Professor of Financial Management and in 1980, the George F. Baker Professor of Business Administration. From 1995 to 2005 he served as senior advisor to the president of The World Bank. McArthur has held numerous corporate directorships, committee memberships, and consulting posts in business, government, education and health care organizations around the world over the decades. He is or has been a director of the AES Corporation, Arvida Corporation; the Asia Pacific Foundation of Canada; Avenir Group, Inc., BCE, Inc.; Benchmarking Partners; Boston World Partnerships; Buckeye Pipe Line Company; Cabot Corporation; the Advanced Leadership Program of the Canada School of Public Service; Center for Surgery and Public Health at Brigham and Women's Hospital; Chase Manhattan Corporation; Controlled Rick Insurance Co., Data General Corporation; Detroit, Toledo and Ironton Railroad; Development Gateway Foundation; Duke University Health System; e-Rewards, Inc.; Glaxo Wellcome plc; GlaxoSmithKline plc; HCA Inc.; Koç Holdings A.S, Istanbul; Multibank Financial Corporation; National Aviation and Technology Corporation; New England Transportation Co.; The Pennsylvania Corporation; People Express Airline; Rohm and Haas Company; Springs Industries, Inc.; Student Education Loan Fun, Inc.; Telesat Canada; Teradyne Inc.; Thomson Reuters Founders Share Co, London; and Urban National Corporation. He was a trustee in bankruptcy of Penn Central Transportation Company, a founding board member of the Canada Development Investment Corporation, and a member of the Task Force on the Future of the Canadian Financial Services Sector. He has served in numerous roles over the years for the mayor of the City of Boston. For many years, he served as chair of Boston’s Brigham and Women's Hospital. Following the affiliation of Brigham and Women's and Massachusetts General Hospital, he was founding cochair of the board of trustees of Partners HealthCare System, Inc. He has been a trustee of the Museum of Fine Arts in Boston, the US Friends of the National Arts Centre of Canada, and is a board member of the Initiative for a Competitive Inner City. McArthur has also served or serves on the boards of overseers of several other organizations, including The Anti-Defamation League; Brandeis International Business School; Canada 2020; the Council of Canadian Academies' Expert Panel on Management, Business and Finance; Fondation Jean Monnet pour L'Europe, Lausanne, Switzerland; Foreign Business Council, International Institute for Management Development, Lausanne, Switzerland; Junior Achievement, Inc; Koç University, Istanbul; National Coalition on Health Care; The Netherlands School of Business, Nijenrode; Nomura School of Finance and Business Studies, Japan; Partners In Health; Ritsumeikan Asia Pacific University, Japan; the Social Enterprise Initiative Advisory Board at Harvard University; and both the Graduate School and the Business School of the University of British Columbia. He has received Distinguished Alumni Awards from Burnaby South High School, the University of British Columbia, and the Faculty of Commerce and Business Administration at UBC. He has also been awarded honorary doctorates from Middlebury College, Queens University, Simon Fraser University, the University of British Columbia, the University of Western Ontario, and the University of Navarra in Spain. Other awards include a Management Achievement Award from McGill University, a Harvard Statesman Award from the HBS Club of New York, and a Canadian Business Leadership Award from the combined HBS Clubs of Canada. He was named as a lifetime trustee at Brigham and Women's Hospital in 1996. In that same year he was also selected as honorary coach of the Harvard College men’s ice hockey team and a member of the Harvard Varsity Club. He is an honorary citizen of the town of Remauville in France. The John and Natty McArthur University Professorship was established at Harvard University in 1997. McArthur Hall was dedicated at Harvard Business School in 1999 in recognition of his contributions to Harvard University. A group of Canadian alumni announced the creation of the John H. McArthur Canadian Fellowship program in 2002. In 2007 he received the Director of the Year Lifetime Achievement Award from the National Association of Corporate Directors. Brigham and Women's Hospital announced the John H. McArthur Fellowships in Medicine and Management in 2010. McArthur and his fellow honorees will receive their Order of Canada insignia at an official ceremony to be held at a later date.